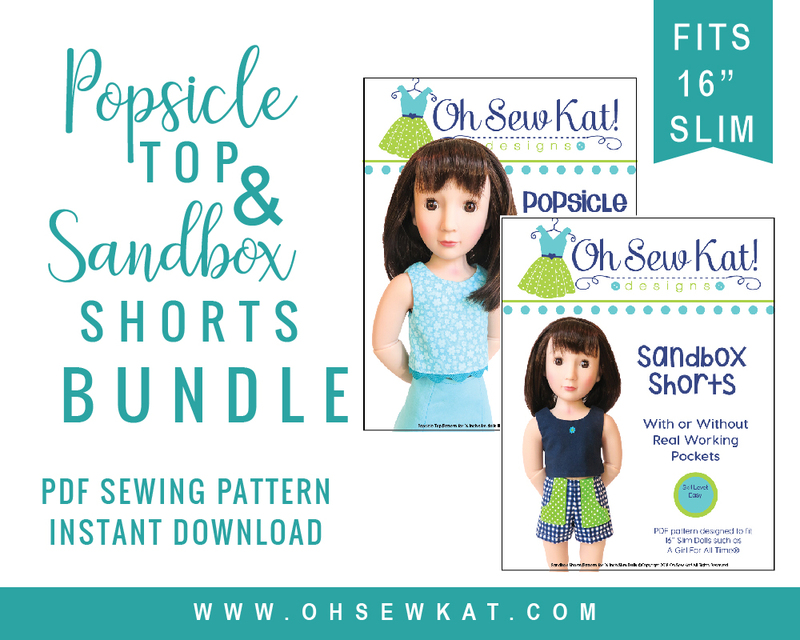 Popsicle Top – Oh Sew Kat! What is more fun than dressing dolls up in adorable Halloween costumes that you make yourself? Here are a few ideas of costumes that your Wellie Wishers would love to wear. All of these patterns are also available in other doll sizes in my Etsy Shop. Today’s costume theme is the color BLUE!! 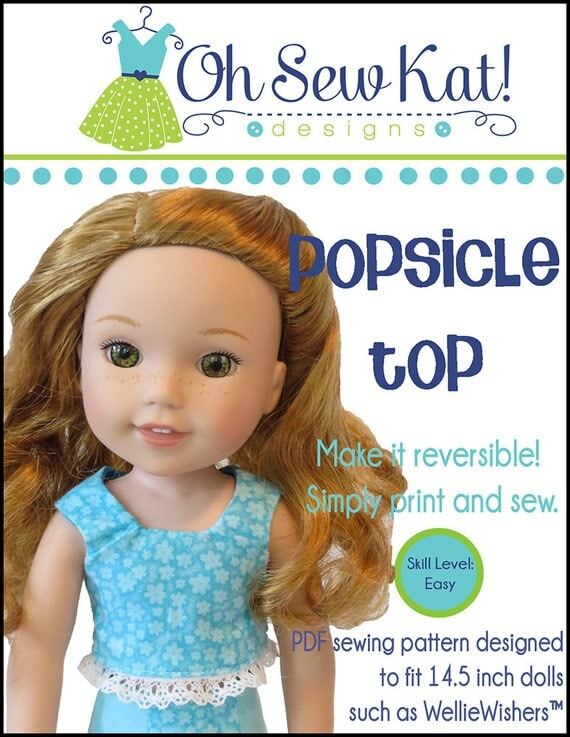 Use the Popsicle Top and Sixth Grade Skirt patterns to make a sweet Elsa inspired costume. The full tutorial for the skirt is HERE. Julie H. of Sew Dolled Up 81 made this beautiful ice princess outfit with the Sugar n Spice pattern. It’s amazing how some fancy fabrics can completely change the look of a simple dress pattern. And finally, Jaci G. of JGooseandCo made this beautiful Alice in Wonderland outfit for her Hearts for Hearts doll with the Sugar n Spice pattern with included bonus apron. See more Halloween costume ideas here and here, and be sure to check out the Inspiration Gallery as well. These adorable outfits were made as a special order for a good friend to give as a gift. She gave me a price range, and let me decide what I would make. I love to sew that way! I don’t know the child, so I thought a few pieces that mixed and matched together in different ways might be a good place to start. 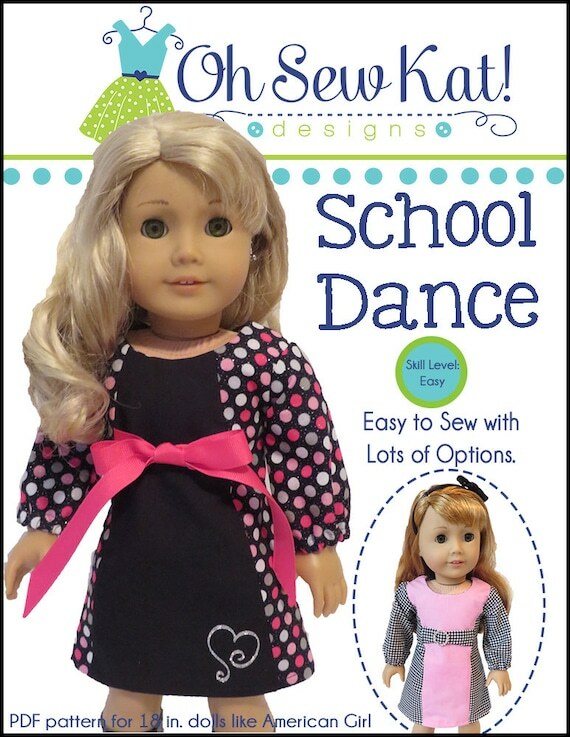 Make doll clothes for Wellie Wishers and Glitter Girls 14.5 inch Dolls with easy sewing patterns from Oh Sew Kat! 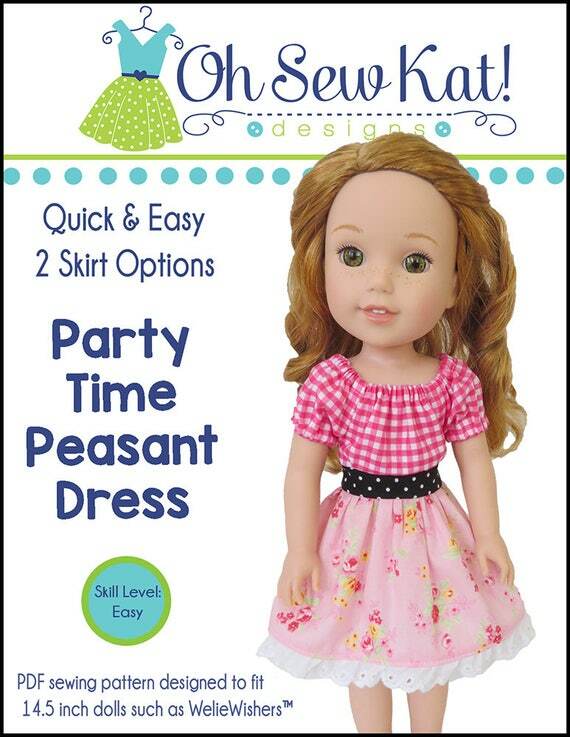 My favorite pattern for all dolls, but especially the Wellie Wishers, is the Party Time Peasant Dress. 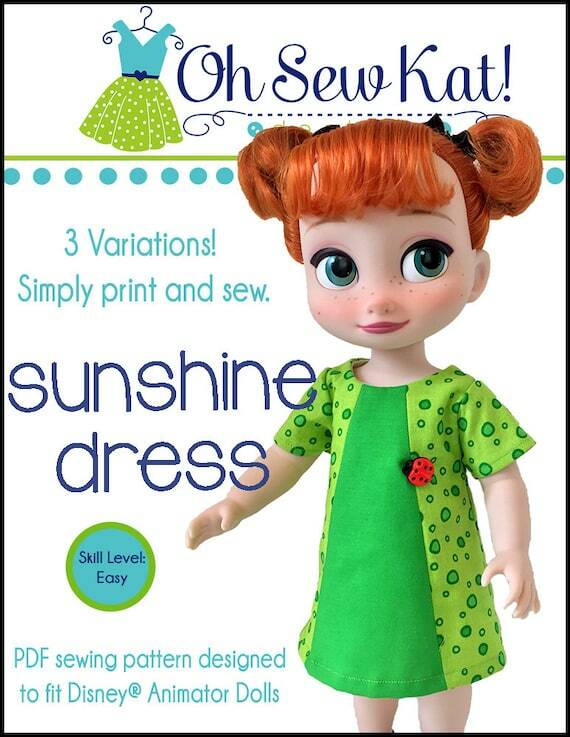 This dress lets me use three different, cute fabrics at once and is now available in 5 doll sizes! I wanted to make two tops and two bottoms. The tops I chose are the Playtime Peasant Top (purple), the reversible Popsicle Top (pink stripes and puppies). The two bottoms I decided on are the Four Season Skirt, and Sandbox Shorts with contrasting pockets. Between these four pieces, the lucky, little girl can make 6 different outfits! Because I used fat quarters, I still have enough of each color that I could make another set. Inexpensive fat quarter bundles from Walmart and other craft stores like Hobby Lobby are great for these kinds of projects! I hope the little girl enjoys her new doll clothes! I had fun making them for her! Find the link for the free Four Season Skirt pattern by clicking HERE. The Sixth Grade Skirt was the pattern that started it all! I had just finished a pattern making class, and a few friends and I were all working together to publish our first patterns. We worked together and tested each others’ work, challenging ourselves to publish our first patterns! We all did it! And the Sixth Grade Skirt was mine. Because it was my first pattern, the learning curve was pretty steep. Who knew there was so much work in a pattern? I chose a simple design that my (at the time) 12 year old daughter could easily sew. Thank you to all of you that have purchased this (and any that have come since!) pattern! 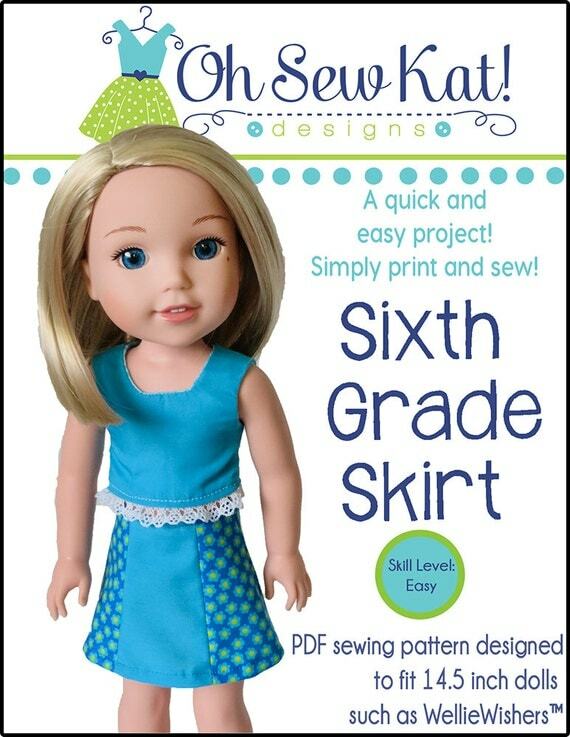 The Sixth Grade Skirt is a simple skirt to sew. 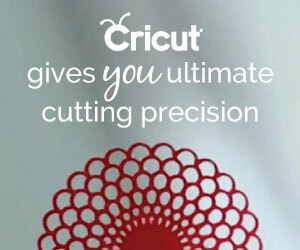 From cutting to finishing, you can easily complete it in under an hour. With the overlap in back, it’s easy to fit for different sized dolls. You can make it for summer, or winter, or anything in between! Add pockets to your skirt with this easy tutorial! Choose shiny fabrics and pretty trim to put in between the seams. Here is the Sixth Grade Skirt for Hearts for Hearts Dolls. Make an easy skirt for your Hearts for Hearts Dolls. This rainbow skirt was fun to make and is perfect for a hot summer day. I turned my fabric when I cut the center panel for interest. Maryellen is ready for the holidays in her red, corduroy Sixth Grade Skirt. A perfect fall skirt to take your doll right into the holidays and on to Valentine’s Day! Make an easy skirt for your 18 inch dolls. 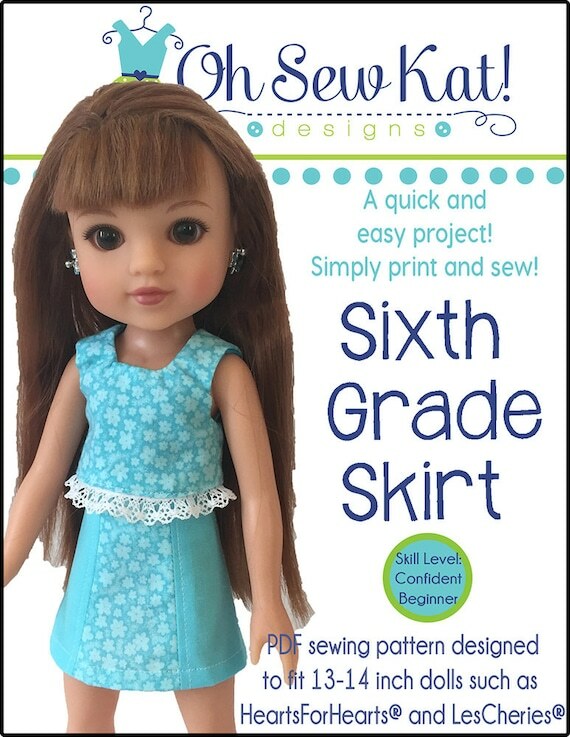 School Bell Blouse and Sixth Grade Skirt by Oh Sew Kat! Make an easy skirt for your Animators’ Dolls. Rapunzel’s summery outfit was stitched by Jaci of JGooseandCO. Mixing and matching prints make a perfect play outfit for Disney animator dolls. Find the patterns here to stitch up your version today! You can find all the sizes in my ETSY SHOP. These patterns are also available on Pixie Faire, and You Can Make This. 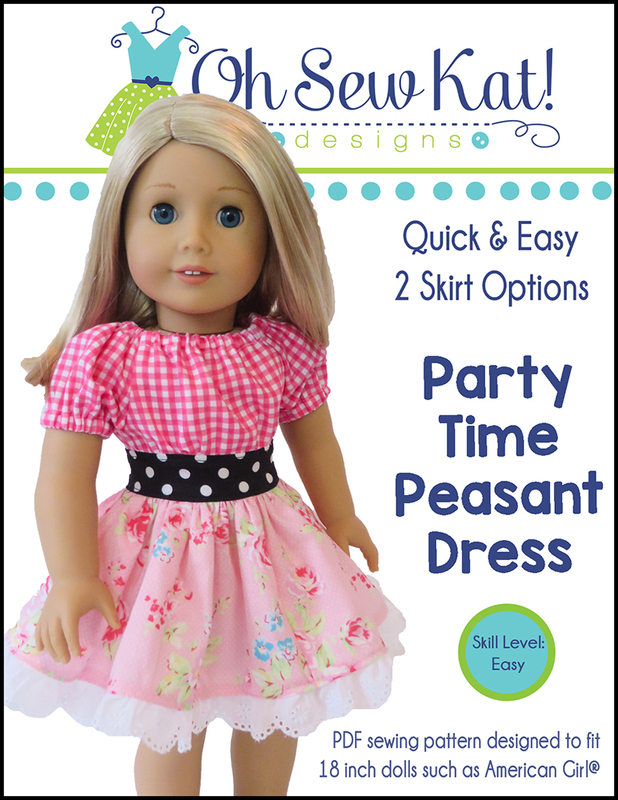 Make an easy skirt for your Wellie Wishers Dolls. Shirley of Doll Clothes by Shirley used the Sixth Grade Skirt with pretty embroidery and fold over elastic as the trim for her Wellie Wisher outfit. Team Spirit! Game Day spirit wear for dolls. Do you have a favorite team? It’s so fun to stitch up a spirit outfit for your dolls too. The Four Season Skirt, with just a few seams and no pattern pieces, is my favorite to make up a quick spirit outfit whether it’s MLB Baseball, our favorite colleges, or a football team. This skirt can be made is less than an hour, and the pattern is FREE in 3 sizes when you join my email list. It’s the perfect match for the reversible Popsicle Top! This cute Wisconsin outfit was stitched up by the Pearl Pony. You can find her on Facebook. 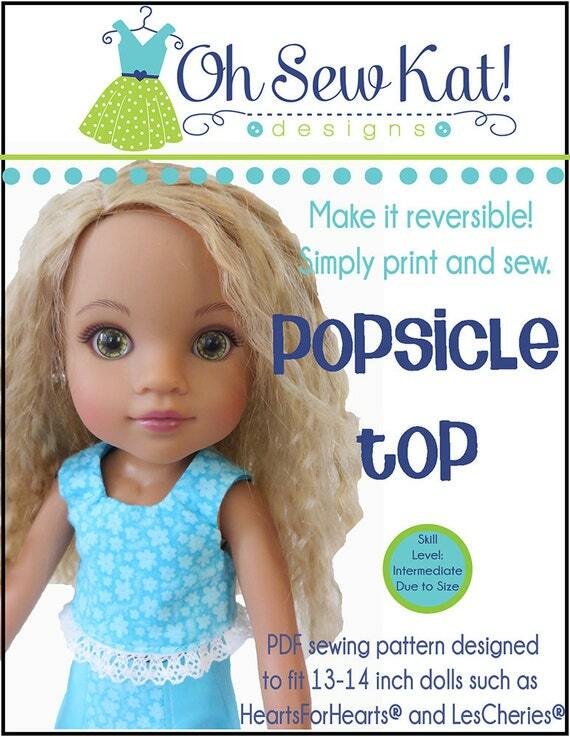 She also used the Popsicle Top pattern with the Four Season Skirt. Don’t forget the Wellie Wishers and the Glitter Girls! They have school spirit too! Lanie’s ready for Hokie Game Day in her Va Tech FOUR SEASON SKIRT and Willa’s pinafore is made with the Sugar n Spice pattern. Lanie is wearing a Sweet, Simple Tee with her Marquette U Four Season Skirt. Camille has hers with the Popsicle Top. Kailey is all set for a warm, fall Game Day in her Cal Bears Bloomer Buddies Top. This top is a quick sew; make one up in an afternoon! What team does your doll cheer for? Find all these sewing patterns and more in my ETSY SHOP, and on Pixie Faire. It’s time to Style it Up! Open up your doll’s closet and dress her in a fresh, new color combination! Getting ready to sew? Try putting these fun colors together, either as complete items, or bright accents. Dress your dolls in dreamy pinks and blues to move from a balmy spring to a sizzling summer! Bright blue and hot pink make me think of the the tropics. 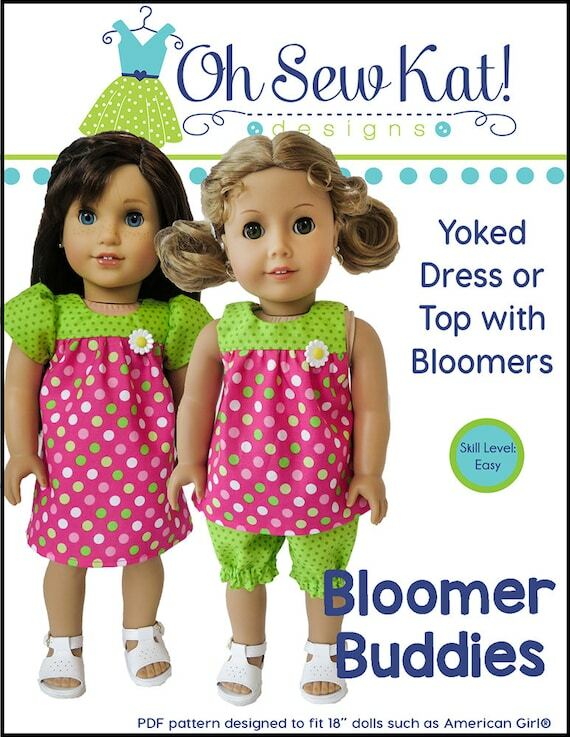 A bright combination in any pattern, your dolls will shine in these colors. I used one batik print as my focal point for these outfits. (Grace is wearing a School Bell Blouse with the easy Sixth Grade Skirt. Lanie has a Popsicle Top paired with Sandbox Shorts). I love the added sparkles a few crystals can give! How about just a splash of color? You can even take each shade a little lighter! Here the Boardwalk Boutique for Animators gives the princess dolls a soft and feminine look for spring and summer. Find all the patterns for these outfits and much more in my Etsy Shop and at http://www.youcanmakethis.com and on Pixie Faire. What will your doll wear when you Style it Up? 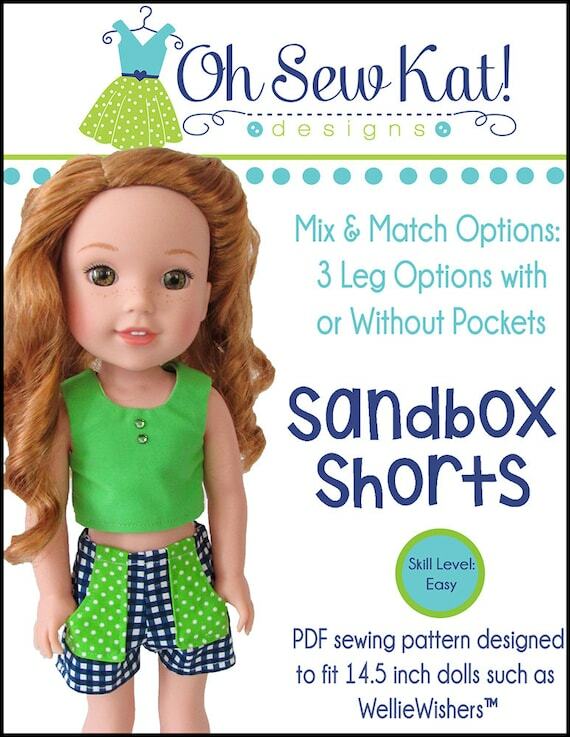 Get your dolls ready for the summer fun with these easy to make, pull on shorts with real working pockets. Sew the pockets on the inside!! See how here! Pair your shorts with a reversible POPSICLE TOP to complete your summer outfit! It’s about time for the bitties to get some love here at Oh Sew Kat! I’ve released my first few bitty sized doll clothes patterns, with more in the works! 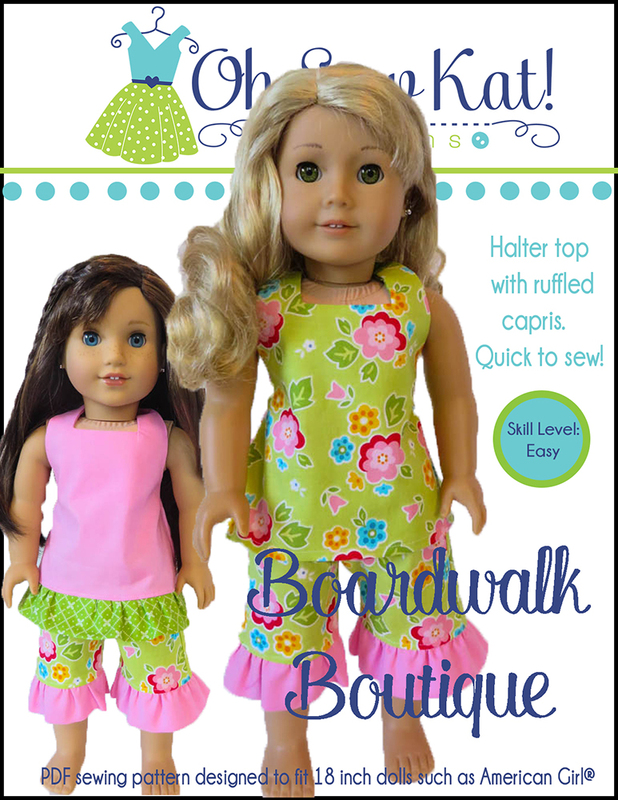 In fact, Boardwalk Boutique is now available! I chose two simple patterns to start because they offer an easy project for young girls to learn to sew. The pieces are a bit bigger than the AG size, and these patterns are quick and easy but can be embellished in lots of ways. The top is reversible!! 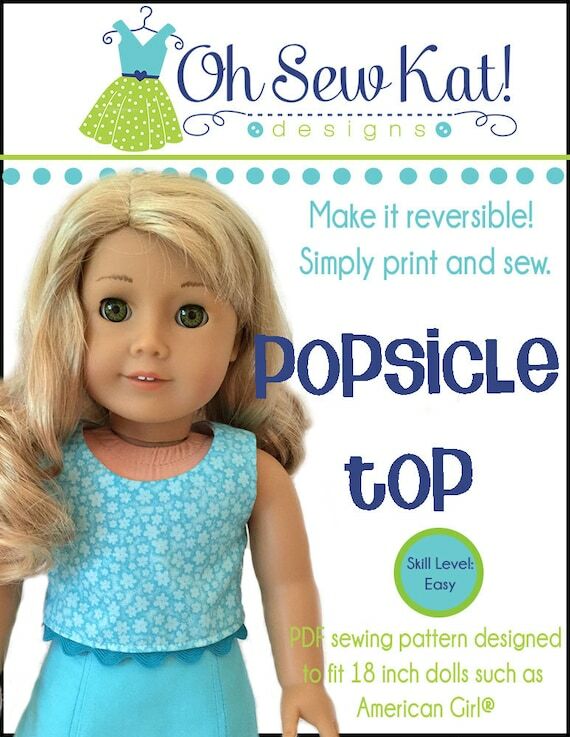 I do suggest you try the top and skirt on your bitty doll before adding the hook and loop tape. Depending on how “loved” the doll is, your bitty could be a little thinner than mine. 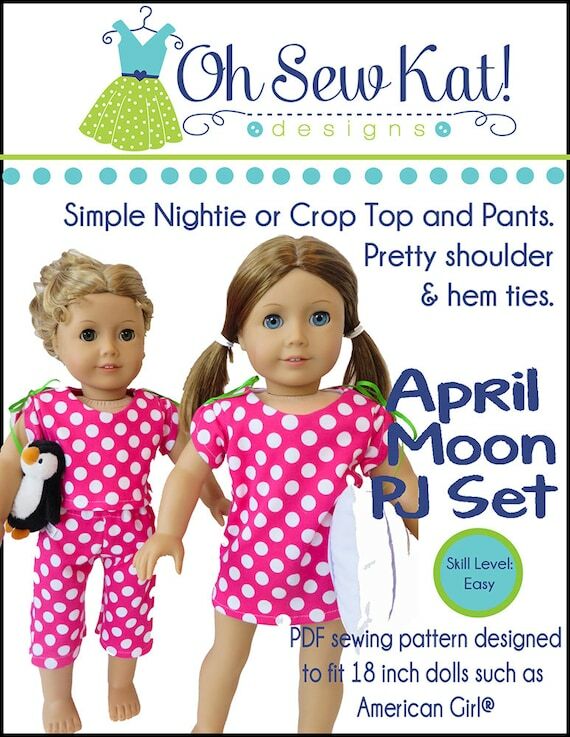 This pattern is also perfect for your Bitty Twin dolls too! Find the Bitty Baby Popsicle Top Pattern Here. Find the Bitty Baby Sixth Grade Skirt Pattern Here. Find other patterns for Bitty Baby/Bitty Twins Here. Today’s Tester Tuesday features the talented Ashley Craw of SewandSoar. She has a great sense of color and style and offers trendy fashions in her Etsy shop. Be sure to check her out there and on Instagram! Get your bitty baby doll ready for the summer heat! Find the patterns here and here. See more ideas for Popsicle Tops here and Sixth Grade Skirts here. You can also find Oh Sew Kat! patterns for Bitty Baby on Pixie Faire and You Can Make This. It’s March already! Spring is coming a bit early around here…flowers are blooming in the gardens and the trees are starting to bud. Nothing says spring more than the popular color combination of bright yellow and bright green! You can see the freshness! 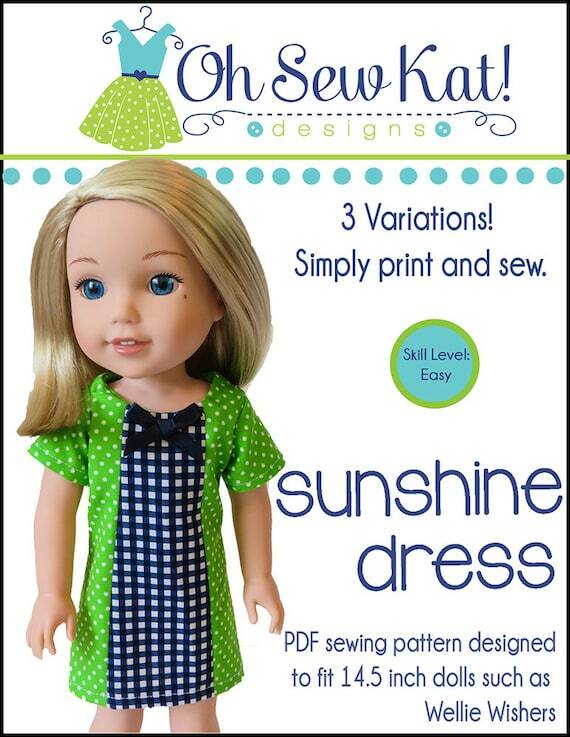 Find these doll clothes sewing patterns and more in my Etsy shop. 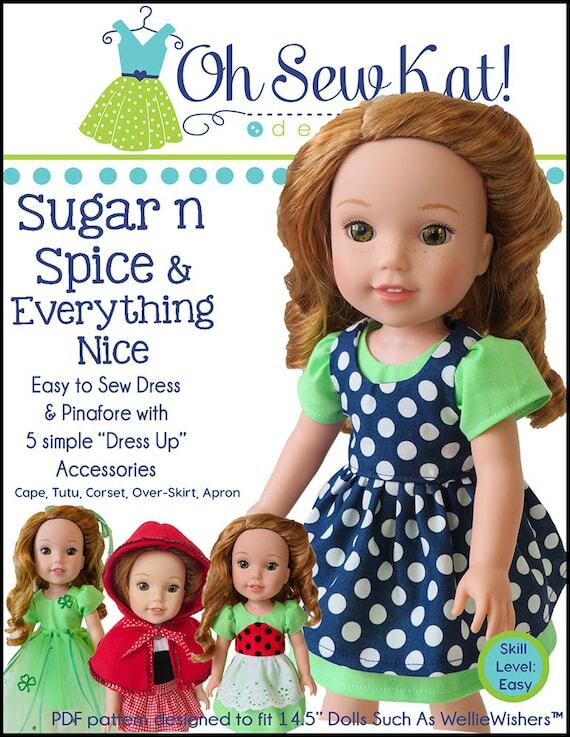 Here at Oh Sew Kat!, this post will feature a new, trendy, fashion color combo for you to try with your own dolls. Look through what doll clothes you have, and see what new stylish outfits you can create in combinations you haven’t thought of! Sewing something new? Be inspired by these bright, sunny colors! Here are a few I came up with. Yellow is my absolute favorite color, and lime green is no stranger in this house! Kelly is wearing a pair of skinny, green jeans (LJ pattern) and a knit top I purchased on Etsy. Lanie has her Popsicle Top paired with Sandbox Shorts (I put the pockets on the inside, like THIS) and Grace’s Sugar n Spice dress takes on a whole new look with a green corset from the Everything Nice part of the pattern. Mix and match your Oh Sew Kat! patterns to make a full fashion wardrobe for your doll. Even the Wellie Wishers look ready for spring! Ashlynn has her Sugar n Spice dress with Everything Nice corset, and Kendall’s Popsicle Top is paired with a Sixth Grade Skirt. 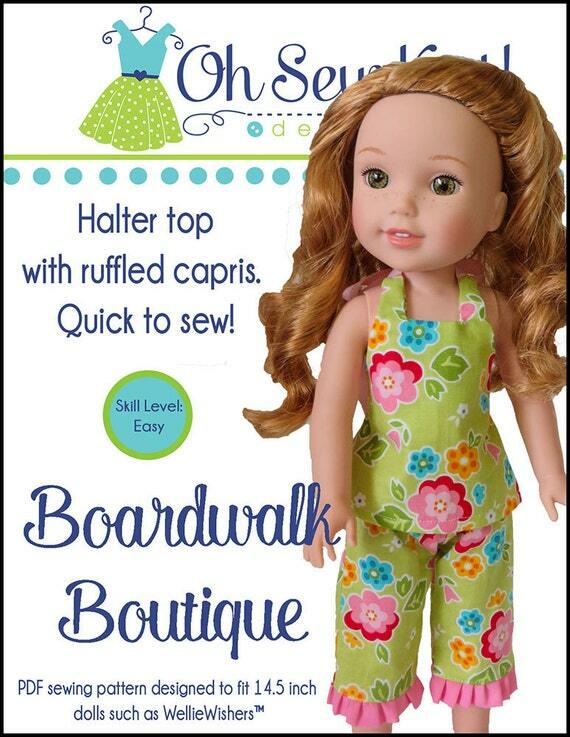 Willa is wearing the super popular halter top from Boardwalk Boutique and bloomers from the Bloomer Buddies pattern! Oh Sew Kat! 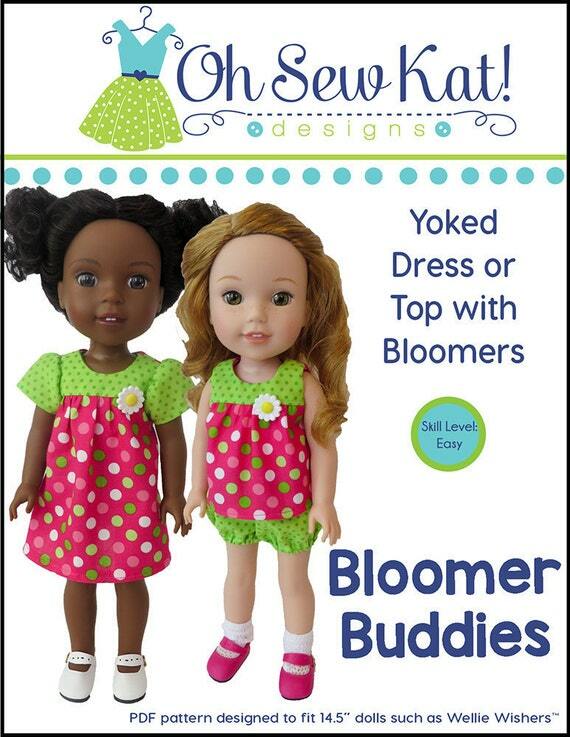 patterns offer lots of mix and match options for your doll’s wardrobe. I’ve only posted a few here. Don’t forget to add cute accessories like a purse, hat, or shoes. Even if you don’t combine the colors in the same outfit, your photos will look bright for spring with this amazing pop of happy color! Try yellow and green as part of other fun combinations! Share your photos on instagram with #ohsewkatcolorcombo, #ohsewkat, or to my facebook page: www.facebook.com/ohsewkat. So go ahead, and STYLE IT UP!! Visit my Etsy Shop to see more patterns available for dolls of all sizes: www.etsy.com/shop/ohsewkat.